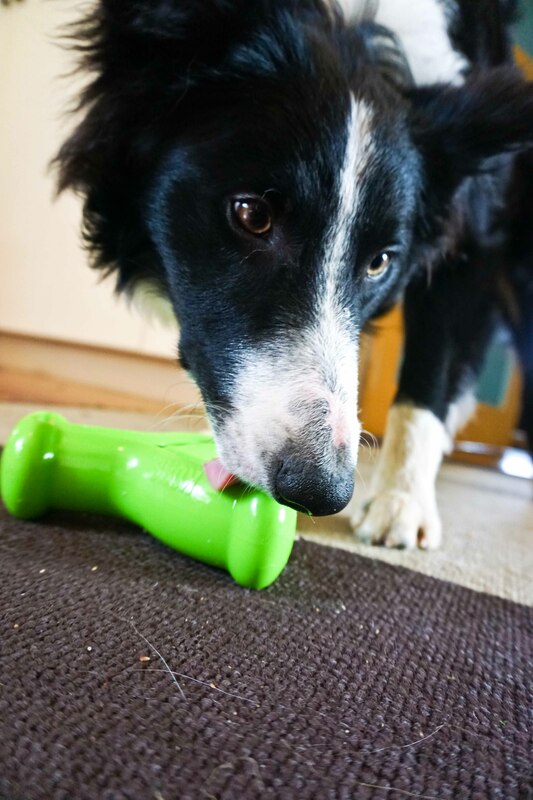 Border Collie product tester, hard at work. 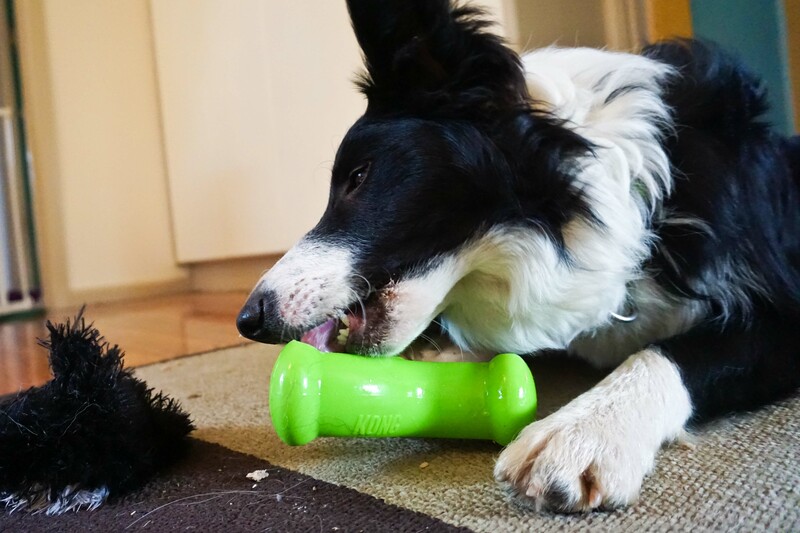 So, ages ago, my friend Amanda over at Pawsitive Aussies showed me these new Kong products. They looked neat, and I found them in the store some time after but didn’t buy them as they looked too easy for my dogs to figure out. Amanda posted some photos of her Aussies working on them, and told me what she stuffed them with and so I took the plunge. And let me say, it has exceeded my expectations. 1. Soft balls of meat (like 4 Legs) work well. Or you could do some 4 legs to plug the holes at the end, and kibble in the middle bits. 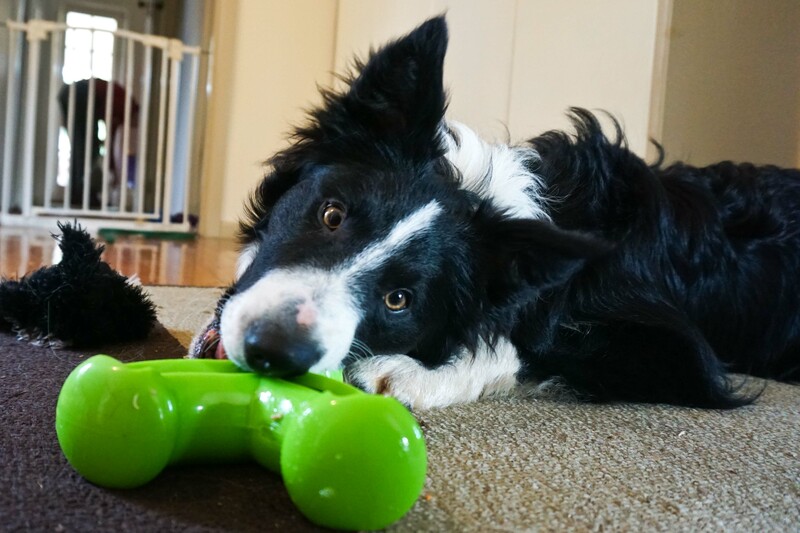 For Loki, stuffing the whole thing with 4 Legs is difficult enough to keep him working at it for 30+ mins, but with enough success that he’ll keep trying. I’m certain you could stuff it with any kind of meat or meatlike substance and freeze it for an even longer-lasting challenge. 2. Lumen is too wiley to be fooled by balls of meat, so I found these dried sausages that are the perfect size for the long straight bits AND fit perfectly in the holes. It took her AN HOUR of working at this thing the other day to get the sausage out, and still couldn’t get it out of one of the holes. HA HA! Considering it takes her about 20 mins to get through a regular peanut-butter-and-biscuit type kong, this was great. Loki finds this too hard and gives up. 3. If you want to put kibble in you definitely need to plug up the end holes or it just falls straight out. Bigger kibble would be better than smaller as it still falls out a bit easily for my guys, unless you get creative. I haven’t tried it with peanut butter yet and I don’t know how much of a challenge it would be, since that’s more about licking – I found if they actually had to try and get something out with their teeth they’d get really stumped. None of my guys have destroyed it, though Loki has tried gnawing the ends to get the sausage in his more desperate moments of frustration, but they don’t show any signs of damage. That being said, NONE of my guys are strong chewers and have plenty of their original toys left, and don’t tend to destroy stuff. I reckon this rubber is soft enough that if your dog was a strong chewer, they’d get destroyed pretty quickly. We’re still learning the optimum way to stuff this for maximum duration but also letting them experience some success so they don’t give up, but it’s certainly got more longevity than I thought it would. I’d give this product an A.
Kong hasn’t given me any of these for free or asked me to write this post so this is really my opinion having spent $20 on the thing then having found out I could buy them with free shipping for $13 on eBay. I remember when I was considering doing ST’s class, I really wanted to find a review to help me make my decision. I’d found some other blogs that talked about what they’d been working on, but nothing to say how they found the class. So, I’ll write my own. Keep in mind the class hasn’t finished yet, that I am who I am (eg. Husband tells me I analyse my videos obsessively, which means I usually solve my own problems or answer my own questions for Silvia) and that I run the dog I run. It’s great to be able to get Silvia’s feedback on your videos, suggestions for improvement and idea on where to go next. Of course, this is the main draw-card of the class. A program to follow to build on skills and exercises that progress you from one thing to the next, while working on things you weren’t aware you were working on (eg. I’d say Lumen’s obstacle focus has improved immensely but I haven’t been ‘focusing’ on obstacle focus, if that makes sense). If you’re so inclined, heaps of other videos to watch, to see how different people are doing things, how they’re working through training issues, etc. I don’t watch other videos because some of the dogs are so drivey and fast that it makes me sad that Lumen’s not like that, then Husband got grumpy at me for getting sad, so I had to stop watching them. 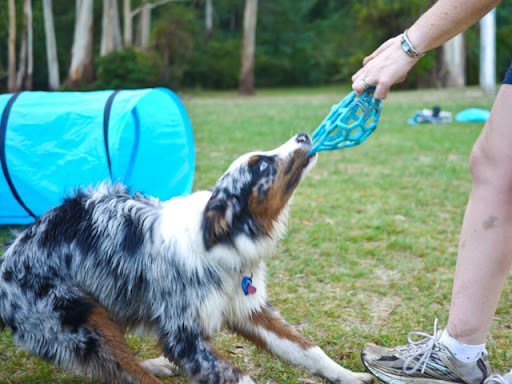 I can definitely see improvement in Lumen’s speed, obstacle focus, understanding and drive, but of course this comes down to what you do as a handler, too. 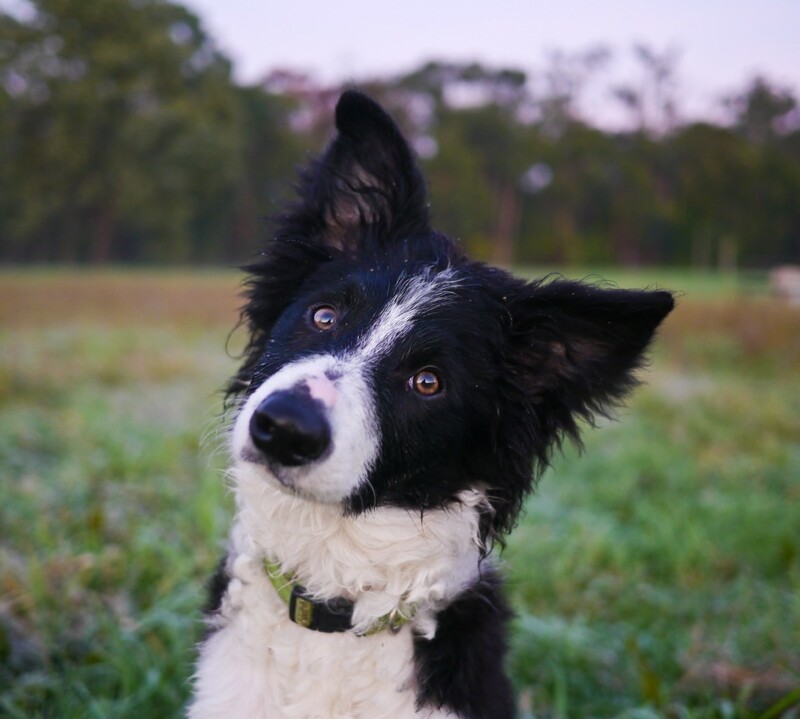 Silvia is happy to answer questions on most anything, from the course itself, weaves, seesaw, running contacts, stays, recalls while out walking, how to condition your dog, etc etc. I feel like the class was too busy. Perhaps it needed to be capped at a certain number of people. Which isn’t to say she doesn’t reply to every comment, she does, but I found that particularly at the start when I was really working on Lumen’s wrap speed, that the comment might be “Looks great! Keep doing that!” to which I’d be thinking: well, it doesn’t look great, she’s still slow, and I don’t want to keep doing it if it’s not speeding her up. I felt like I was ‘on my own’ a lot because of this. Part of this problem, as I mentioned above, may have been because I enjoy solving the problems myself, I know how Lu works, and I was trying different things already so she didn’t need to make any suggestions, but I felt a bit like sometimes the feedback was positive, but not helpful. Particularly as a teacher where you’re taught to give useful feedback that will help the student improve. I suppose this is my biggest (and possibly only) con, as it covers so much of how I felt about the course. Sometimes you could get her in a kind of ‘conversation’ to discuss more and more of whatever issue you’re having, but the majority of my feedback was “Looks really cool, keep doing this, and maybe start from further away” or something, and that would be about it. I suppose I was just expecting more. Being so analytical of myself I found this ‘on the surface’ feedback, well… on the surface! That being said, I might take the course again with Lu next time it runs as I’ve definitely seen improvement and know we have a lot more work to do, and as she gets better and better, our questions should become more and more technical and possibly move beyond my experience to solve them. I think I’ll know what to expect this time in terms of feedback, and will anticipate replies will be helpful when uploading these issues, rather than ‘checking in’ to see how we’re going as I was doing at the start. Then again, having just looked back through all my videos from when we started the class I’m not sure why I felt we were slow because she doesn’t look THAT bad… Maybe it was more of a feeling than what showed up on film. Weird. Now reviewing a toy this week but something very dear to my heart all the same: harnesses. Sometimes I hate the internet for all its information, which then turns out to be disappointing or misleading. About a week ago, against my better judgement, I logged on to CleanRun’s free shipping section, measured Lumen, and clicked ‘buy’ on a ComfortFlex Sport Harness. Now, as you’ll be able to tell from the review, I’m certainly not being sponsored to write this post, and am not affiliated with ComfortFlex or CleanRun in any way. I’d read heaps of positive reviews. Only one negative review that complained that although the girth fit the dog, the chest was way too big. Well, your dog is weird, I thought. 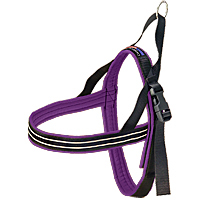 I’d even read reviews from someone who had very touch-sensitive rescues who were quite happy with this harness. That’s promising! I don’t know if I’ve mentioned it here yet but Lumen is a cat. Her Mum is very flighty when it comes to putting things on her, over her head, etc, and Lumen is exactly the same. And I promise you, this is not through a lack of socialisation as a pup because she loves cuddles and pats, everywhere. But, drape a lead over her back and she’ll crab-walk to avoid it. Put a lead in her path and she can’t bring herself to push under it, and does a big song and dance about going around it. Then, there’s harnesses. Every harness I’ve ever tried on her (bar one, and it’s not this one), results in a frozen, awkward, crab-like dog who walks with a stiff tail and can’t move faster than a weird walk, and won’t play with toys. Not exactly conducive if you want her to be doing full-on running in the harness. So, for whatever reason, I thought maybe this one would be different. It arrived quickly- a week after I’d ordered, folded up in a little parcel. I opened it and it felt a bit stiff. I did some clicker training with Lu, getting her to nose-touch the harness, and then gradually to put her head through the head hole. The hole was generous, meaning that, amazingly, she was actually happy to stick her head through. As always, she baulked a little the moment it sat on her back, but she was ok with it. I did the harness up, and she seemed ok. Once we’d played around with it initially like this, I did it up – the medium size girth was too big for her, despite her having a 24 inch girth, which falls into the medium size I bought- as she’s only 7 months old, I didn’t want to order the next size down incase she still had filling out to do, since the maximum size of the Small/Medium was 25 inches. So, I couldn’t really do up the girth tight enough and also do the buckle up… it was either velcro by itself and tight enough, or too loose with the buckle. Hmm. Also, the chest strap was huge. I’m talking it stuck out off Lumen’s body by a good 4 inches. I know she’s a baby but she’s a female- I don’t think she’s going to be getting that big of a chest any time soon. Harness done up, I pulled against it, and felt her resist – that was nice, and a nicer feeling than her other harness that I don’t think pulls on her as comfortably. I threw a treat forward and…. Tail frozen… awkward crab walk. Look, possibly I could spend the next few weeks trying to clicker-train her into liking this harness on her but I honestly don’t know if it’s going to happen. She’s pretty strongly hard-wired to hate anything on her (thanks, Lumen’s mum, for that) and doesn’t ever relax enough for me to reward her for wearing the harness and being normal. The thing is, she’ll let me put it on, and do it up, but try and get her moving and you can forget about it. If anyone has any bright ideas, please let me know. I’ve borrowed one harness from a friend and it’s the only harness in existence so far that she moves normally in once it’s on, so it can be done! Just this particular harness doesn’t work for my dog. So, to all those positive reviews out there, I’m sure the harness works well for you, but I’m in the category of having a weird dog with a small chest, who hates wearing harnesses, even nice, soft comfortable ones that would be really fun to do agility in. Unfortunately, I think I’ll be sending this one back to America.